Apple on Monday took the wraps off its latest iOS 12 software, unveiling a range of new features and performance enhancements slated for a fall 2018 release. Among the most promising of those features is a new app and AI-based framework developed by Apple, dubbed Siri Shortcuts, which the company claimed will make users’ lives easier by allowing them to automate many of their most common tasks at once using a single Siri voice command. Now, less than a week later, The Sun reports that Apple is being sued by a small tech start-up called Shift, who’s claiming that the Silicon Valley tech-giant stole its logo and used a “strikingly similar” variation of it to headline the new Siri Shortcuts app. “It’s mind-blowing that Apple, the firm with the biggest cash pile in history, the firm that is so design oriented, had to copy our logo,” a Shift spokesperson said, adding that Apple’s new Siri Shortcuts logo is already stirring-up “confusion in the marketplace.” Indeed, Shift’s legal counsel conveyed in a statement to The Sun that people have somehow already come to associate Apple’s logo with the Shift brand. However in terms of an actual, legitimate legal precedent, it’s unlikely Shift will walk away with anything here. 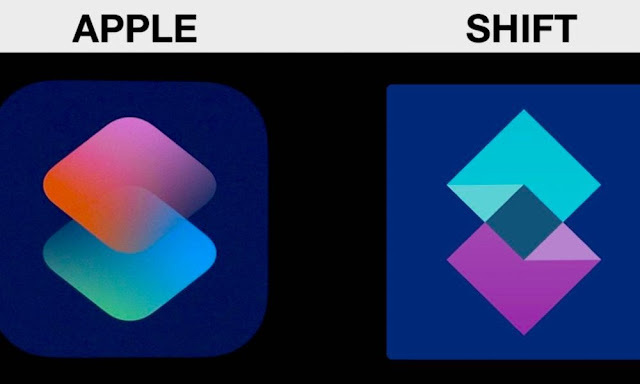 As you can see in the image above, not only does Shift’s logo hardly even look like Apple’s, save for the whole reversed color illusion thing, but it’s just highly unlikely Apple is going to be held liable over a logo design that’s got Fiverrwritten all over it.